Donald Hubbs had been in the Navy nearly 20 years. He was considerably older than most of the other pilots flying missions in Vietnam. "We were a Navy family,” Jill remembered. Unfortunately, the Hubbs family ultimately learned of the loss and sacrifice suffered by so many military families before. But their loss was different — unlike others back home mourning their fallen loved ones, the Hubbs were left waiting in the dreadful void of the unknown. Jill’s father would join the ranks of the missing, those never recovered. It was a difficult loss to absorb. Especially for a child. Jill lost her father in March of 1968. In the years that followed she has never stopped wondering about his fate. And she has never realized any real resolution on the matter either. But there’s always been hope. When Donald Hubbs was lost, he was flying a mission off the USS Yorktown on the North Vietnam coast. He and three other men went off radar and were never seen again. This was not the first shred of hope. Years earlier, Jill and her mother had glimpsed another possible ray of light. "The Vietnamese had released this propaganda film at Christmas time, where they were showing how benevolent they were to the prisoners, and they depicted them in this Christmas service and then working in a garden, and then having a meal or whatever, it was totally a propaganda film, but the military had families come together and watch that,” Jill remembered. In the film, she saw a man that looked like her father. Her mother saw him, too. "We identified a picture, you’re talking about a black-and-white film, and all those years ago, so it wasn’t the best quality, but there was someone that both my mom and I, sitting in different parts of the room, thought was my dad,” she said. But they never heard anything more about the man in the Christmas propaganda film. Didn’t really hear anything more at all until the 1987 live-sighting report. "So they come to the house and they tell us they have this live sighting report and they’re a credible source, it’s the Defense Intelligent Agency, the DIA, they’re a credible source, they claimed to have seen my dad,” Jill said. The family was told that the information had come from a small village in North Vietnam, from a source who said that the Navy pilot was being held along with 13 other American prisoners. The report was vague. And nothing more followed. But, of course, such news breathes new life into long held hopes. A few years later, Jill’s search for answers about what happened to her father took her to Vietnam. It was a desperate quest arrived at after years of waiting. Traveling to Hanoi, Jill met with the Joint Pacific Accounting Command, or JPAC, the agency that handles the cases of Prisoners of War, or those Missing in Action. They provided her with information she was already familiar with — how her dad’s plane had taken off from the Yorktown, how they were lost to radar over water and near the coast, how no wreckage debris was ever located despite an immediate and lengthy search, and how the Vietnamese had always claimed no knowledge of the plane or its crew. But they also had a new bit of information in Hanoi. A new shred of hope, a chance at closure. "They had a Vietnamese grave registration and it had my dad’s name on it,” Hubbs said. The registration was from a province along the coast. A little further south than where the plane was last reported. It was something, but not much. An aging Vietnamese document with a list of names, nothing more. Before leaving Vietnam, Jill thought about trying to locate the source of the live sighting report she’d received a few years earlier. That didn’t end up panning out. Jill’s trip to Vietnam in search of information about her father was a long time ago now. And those shreds of hope have faded with the years. "Nothing has ever come of that grave registration again, or the live sighting report, other than frustration,” she said. It’s been 48 years since Jill found out her father and his crew was lost in Vietnam. Still, small chances for some resolution keep popping up. A couple of years ago Jill said the government asked for a DNA sample. Why? She doesn’t know, they couldn’t say. "Made me hope, you know, why are you asking me for DNA now if you — did they recover something?” she wonders. That would be something. That would allow for the fallen father to receive his proper respects. "They do recover remains all the time,” Jill said, hopeful her questions will be answered in the future. Having been classified as missing as opposed to killed in action, the Hubbs family lived in a sort of hope-against-all-odds world that didn’t allow for the bidding of goodbyes. As such, there has never been a funeral. This occurred to Jill during her mother’s funeral a few years back. Click here to view Donald Richard Hubbs' entry on the Vietnam Veterans Memorial Fund's Website. Jill Hubbs currently resides in Pensacola, Fla., where she works as Director of Education Content and Services at WSRE. 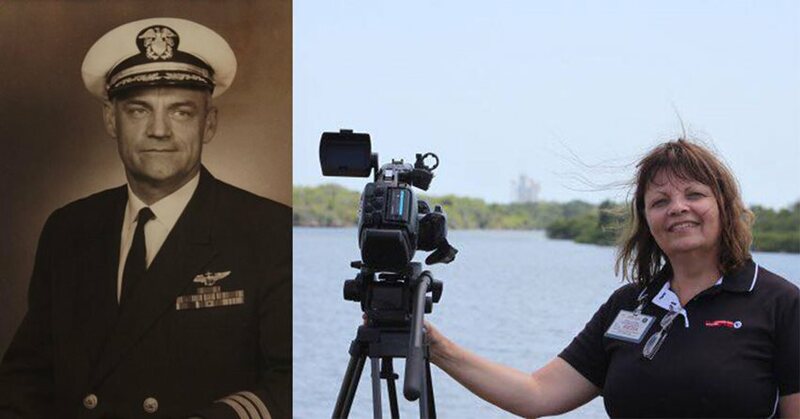 Later this month, check back as she shares about her experiences producing the 2008 documentary about the Veterans Memorial Park Pensacola, as well as her upcoming documentary, They Were Our Fathers, about children who lost parents in the Vietnam War.